When meeting mode is enabled on your device, the microphone is sensitive to sounds from all directions. In fact, the Note 4 device can distinguish a maximum of 8 sources of sound. 2. Tap the Voice Recorder from the Apps screen. 3. Scroll through available recording modes and select meeting mode. 4. Read the message, then tap OK to proceed. 5. To start recording an audio, tap the start recording button and then Speak into the microphone. 6. You will then notice that the screen icon is changed based on sound source direction. To stop or finish recording, tap the End/Stop button. 7. Now choose a voice memo recorded in meeting mode. Just tap the voice memo list icon. Multi-voices will then be displayed, according to sound source direction as the microphone is sensitive to sounds from different directions. You can also mute certain sound sources by tapping on the mute icon for the corresponding direction that sound is to be muted. When in mute, the icon will change into a mute icon. 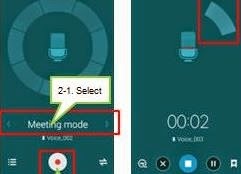 And that covers this basic guide about using meeting mode on voice recorder of the new Samsung Galaxy Note 4. More guides for Note 4 newbies will be available soon in this site, so keep posted.